As THE BLACK CROWES and TEDESCHI TRUCKS BAND continue their own spring tours, they’re excited about their recently announced co-headlining summer tour of outdoor venues along with special guests The London Souls. It runs July 19 in Nashville, TN through August 15 in Rochester Hills, MI. The Black Crowes–Chris Robinson (lead vocals, guitar), Rich Robinson (guitar, vocals), Steve Gorman (drums), Sven Pipien (bass), Adam MacDougall (keyboards) and new member Jackie Greene (guitar, vocals)–have sold over 35 million albums and are known as one of rock’s best live acts. These powerful performances are captured on their newest release WISER FOR THE TIME, a four-sided vinyl collection and double album digital download. They’re currently touring the U.S. on their “Lay Down With Number 13” tour, their first tour since recently ending a two-year hiatus. The trek launched with five sold-out U.K. shows and and is now in progress in the U.S., continuing through June 2. After that, the band will return to Europe for a leg of dates June 18 to July 6, including headlining shows, festivals and two stadium concerts with Bruce Springsteen. Tedeschi Trucks Band, the 11-piece ensemble led by husband-wife team Derek Trucks and Susan Tedeschi, have proven themselves one of the hottest, most uplifting acts on the road today. Formed in 2010 when Derek and Susan decided to set aside their successful solo careers and join forces, Tedeschi Trucks Band delivers a hearty roots-rich musical mix fronted by Trucks’ signature slide guitar sound and Tedeschi’s pliant, honey-to-husk voice. With a repertoire that includes its Grammy-winning debut Revelator and dynamic live follow-up Everybody’s Talkin’, the band kicked off 2013 in the studio to record their second studio album, set for release in late summer. They recently wrapped up five shows in Australia and are back on tour in the U.S. this spring before launching the summer tour. 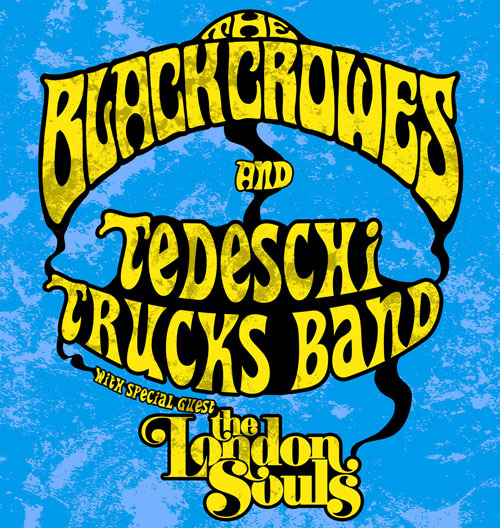 Here is the itinerary for THE BLACK CROWES/TEDESCHI TRUCKS BAND with The London Souls tour. Tickets for all shows are on sale now, except Nashville which goes on sale April 26 at 10:00 AM Central.